Hello there dear reader! I hope that you end of 2016 was great and that 2017 has started in a good way. I am sorry that the updates are rare here. But I guess that is what happens when work and real life wants attention. Besides, it is not so fun to sit in the basement, mending bicycles when it is snowing outside. The basement is gloomy place as it is, but when it gets cold outside, the basement is filled with an bone chilling cold and raw draught. But did that stop me from mending and repairing old bicycles? No, of course not. I was down in the basement anyway, fixing my latest project bicycle. A while ago I bought a bicycle that my brother would use when we went on the Bike in Tweed event. But by coincidence he bought an 1920’s rusty old Monark bicycle instead. So the one I bought become standing in his storage unused. One day I asked him if I could take it back and use as a project. It turned out that he needed some space in his storage so he was only happy to let me have it back. We had already started an light renovation of the bicycle but never really got around to complete it. Now when I had it back in my basement I started to do some research about this new bicycle I suddenly had. What I knew was that it was an Nordstjärnan (Northern star) and that it could be a genuine Stockholm bicycle, but they where own by Nymans that was based in Uppsala. My question was; was it made in Stockholm or was in assembled in Uppsala? How could I date it? Here is a quick story about the bicycle brand. Anton Wiklund had a bicycle shop in Stockholm back in 1886. Where he also had an mechanical shop where he started to manufacture bicycles in 1889. In 1894 quitted Anton Wiklund all work with his company, but the remaining owners kept the name since it was known that the name was equal with good quality. Wiklunds bicycles was very famous competition bicycles, known for their reliability. They made bicycles in their mechanical shop, and in 1900 they needed to move to a bigger place. They had a newly build 5 storage building at Kungsholmen in Stockholm where the company moved in. At that location they build bicycles and motorcycles and later on also imported cars with brands like Fiat and later on even Nash, Chevrolet, Packard, Mercedes-Benz and Rolls-Royce. Really good quality brands in other words. Then there was the economical crash of late 1920’s and the import of cars almost stopped completely in early 1930’s. When the Swedish military stopped buying Wiklunds bicycles around 1932 the business went down even further. In late 1939 Wiklunds went so bad that Nymas from Uppsala bought the Wiklunds company and moved the production from Stockholm to Uppsala. Then the second world war started and in 1941 Wiklunds was closed as a brand. There is of course more information and a great story behind the brand and all different models that they had, but we stops here with the history lesson for now. After I had asked around on some internet forums and different discussion groups trying to date the Nordstjärnan and looking for details about the bicycle. I tried to pin point the year for manufacturing to 1936-1939, that could make it an Stockholm made bicycle. But did I dare to hope? One day there was a fellow on one site I had asked about information that replied to me saying that he had an original catalogue from Wiklund from the -30’s. He enclosed an photo of the catalogue and there it was! It was the same model, the handlebars was the same. The luggage rack, painting and pin striping. It all matched my bicycle. The catalogue was about the model range from 1938. So now I am 100% sure that it is made in Stockholm and that made me really happy since now I have a bicycle that is made in the town where I am born and where my family are from. Also the catalogue helped me in replacing some parts that was missing, for example the handlebar grips. Along the years a previous owner had replaced the original wooden grips with some 1960’s style plastic grips that was horrible. In a drawer I had a pair of original wooden grips, worn in a way so it matches the bicycle. Sadly the luggage rack is in bad shape so I removed (I still have it) but I mounted an registration plate instead, I think it looks really cool and it really defines it to a bicycle made and used in Stockholm. One more thing I did, since the bicycle is used and worn there is no collector item or museum piece. I decided to replace the rear hub. It was original Wiklunds own brand “WINCO” hub. But I replaced it instead with the classical German made Torpedo. Only because, the access to spare parts. The Wiklunds hub have not been manufactured since 1940’s, spare parts are non existing. Around 1940-41, Torpedo celebrated 40 million made hubs. So parts are cheap and easy to find. Also it is very easy for me to repair an Torpedo single gear hub. I also had an old Västerås made “ASEA” head light and an old dynamo laying in a drawer that I decided to use on . One day I saw a visor that fits those old ASEA light on an auction. I fell in love with it right away! Sadly the dynamo is a Swedish made “Neo” that was the bicycle makers Husqvarnas own brand. To be honest, I must replace it. I can not have the competitors made parts from Husqvarna om the Stockholm made bicycle. After all Husqvarna is far from Stockholm and Kungsholmen. Back in the days when all photos were black and white. Well, not that far back in time, only to the time when digital cameras were rather exclusive and very expensive. Back in the end of the 1990’s when I was starting to take photos on a more regular basis and I started to develop and make my own prints in a darkroom in the basement. At that time I was using an old Zorki camera as my main camera. It was a Soviet made “Leica 2” copy made in 1955. The German Leica 2 cameras from 1930’s was considered to be one of the best cameras in the world at that time. They were developed to improve the Leica 1 camera that was a ground breaking design in mid 1920’s. The usage of 135 millimetre film, also the simple, but reliable functions along with the optics that was developed and made by Leitz (that founded the Leica camera company). Leitz lenses with and Leica cameras was top of the line back then. After the second world war, everyone all over the world started to make copies of the Leica cameras because they were so well made and great working. But in Soviet they already had made copies of the Leica camera even before the war. The main manufacturer was the FED factory that was located in Kharkiv (Ukraine). They started to produce cameras in the mid 1930’s, but some years after the war the KMZ factory that was located in Krasnogorsk that is near Moscow, started to make FED cameras due to that the FED factory was behind in production. After a while KMZ developed the FED-Zorki model, but soon after that they changed the name to only Zorki. In fact even the “1” is an addition in recent years. In teh begining it was just “Zorki”. Then with further developments and designs then started to use the add on numbers. It all ended in 1978 with the Zorki 12. Back to the story. When I was using my Zorki camera, I always used the Kodak tri-x film. It used to have a nice grain and good performance so it became “my” brand of choise. I got great results and it was fun to take photos and later on develop and print the photos in the basement. At one point I was visiting an old city in Germany when I by accident dropped the camera on to the cobblestone pavement! It was a rather high fall for the old camera, so of course I thought that the camera was absolutely smashed to pieces. But when I picked it up I could not find a dent, not a scratch anywhere on the camera! That was a surprise! The Zorki camera was simply built like a tank, robust, sturdy and almost indestructible. I just picked up the camera dusted off some dust and it was ready to take photos again. Now, many years later and many different cameras later. 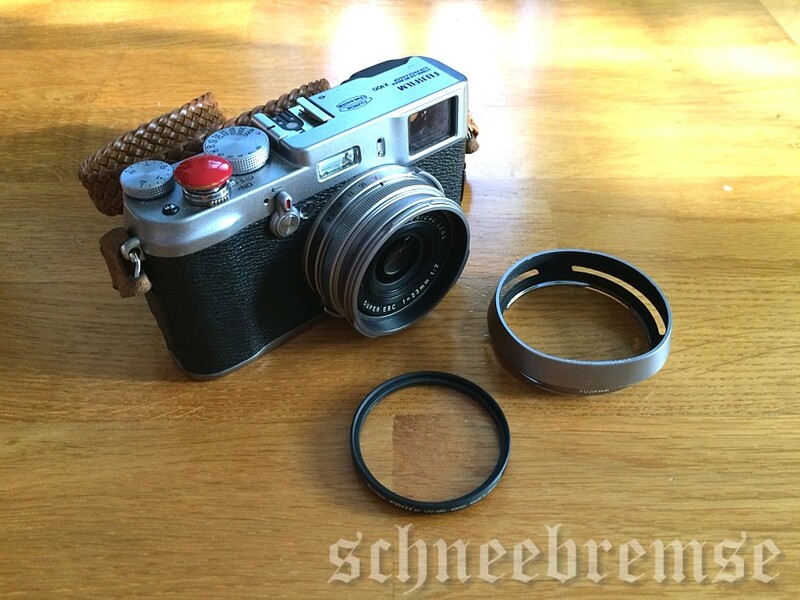 I have been using a Fujifilm X-100 for the last few years. It is a good camera, the sensor captures the colours and details in a great way, the optics are really nice and the camera works like a charm. When I bought it I wanted to protect the lens. So I bought an UV filter so that the filter would take the first hit when the dust flies around. I also got a lens hood, just to catch raindrops, snow, any fingers or anything that an by accident can make a mark or an smudge on the lens. Both lens hood and UV filter? I hear you ask. Well, you can never be to safe. When I attended this year Bike in Tweed event, about a month ago. I brought my Fujifilm camera along, there are lots of photo opportunities of the bicycles and the participants, I posted some of the photos I got in a post about the Bike in Tweed event here on Schneebremse. But at one moment when I trying to get a good photo, crawling around on the ground, disaster struck! While was trying to get some nice photos at the start of the event, I dropped my camera straight down into the cobblestone pavement. At least I was kneeling down when I dropped the camera so it was a short fall, at least that was I thought. The impact was not dramatic or anything like that. But when I picked up the camera, the entire lens hood was smashed like the crash zone on a car. It turned out that the entire impact was on the lens hood when the camera fell to the ground. The camera worked perfectly the rest of the day, I got great photos in total. But when I got home I tried to get the smashed lens hood off the camera. It was really tight and difficult to remove, all bent and crooked. But I finally got it off the threads. But I need to get a new lens hood now after all I think it is a small price to pay, since I rather pay £15 for a new hood rather than £150 for an new camera. But remember the old Zorki camera, it was all metal and built like a tank, no electronic or plastic. Instead of getting a dent, it dented the cobblestones. This year the trip went to south Germany and Munich, the capital of Bavaria. Also home of the (in)famous Oktoberfest beer festival, heavy food and nice architecture. History and modern visions, side by side. Munich centre is a old city with its narrow alleys and old houses, we have “bierkellers” large restaurants with lots of tables and benches where you can just sit down, have a beer or eat some food. Then we have the traditional “biergartens”, that is an outside place where you can drink and eat. Often with large chestnut trees making a comfortable shade over the biergarten. What to eat at those places? Well the traditional dishes like potatoes with grilled pork or sausages and sauerkraut are to recommend, at least that is what I think. Those dishes are always tasty and nice. All these places serve beer from one of the 6 main brewers in Munich. They have big signs outside where they display what brewery they are connected to. Of course the breweries got their own bierkellers and beirgartens, where there are music and lots of people having fun and a great time. It is a special feeling to sit there and eat when the music is playing, sometimes bands with traditional music. But mostly there is no music at all. Only the conversations from all people. My favourite place in Munich is not the the places in the city as you think of it. It is the huge park called “English garten” that is located in the city centre. 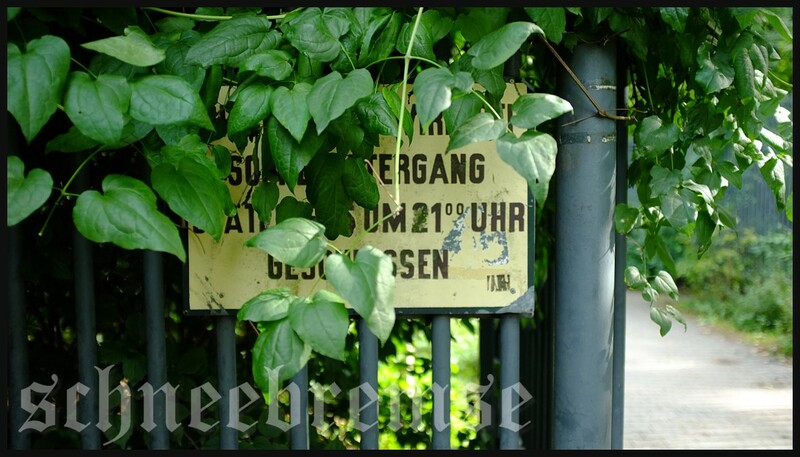 It is was founded in 1789 and have forests, small rivers, bridges, walkways, paths for horse riding and bicycle lanes and even a small man made waterfall. In the middle of the park there is the “Chinesiser turm” (Chinese tower), that is a large building shape in a Asian style that was built in 1789 (rebuilt in 1952). There is an square at the tower where you can buy food and drinks in a open air environment. Just go in to the food court and take the food you want, then you pay on your way out. Then you can sit anywhere, there are hundreds of benches and tables all over the square. The are large chestnut trees standing there giving the dinner place shade in the sunshine. Sitting three with a tweed jacket and just enjoying the moment, that is a great feeling. Now and then there is Bavarian folk music played from the tower. On one of the middle floors there is a band, dressed in traditional clothes playing songs from the alp regions. Or some other tunes. Now and then they play the signal that are so associated with beer and Munich. It is a short melody, that translates: “a cheer, a cheer, for Gemütlichkeit (translated roughly to, cosiness or good cheer)…. one….two…..bottoms up”! People are walking around in traditional clothes, young, old everyone has them. Lederhosen and drindls. You know the cloths all stereotypes ever made of Germans in comedy sketches all over the world. That is the south of Germany and the traditional clothes. But there it is not funny, it is with pride they wear the clothes and hats with pins and huge brushes. The girls with their colourful dresses. Impressive! But the thing that impressed me was all bicycles. Old, new, roadsters, racers, mountain bikes, city bikes. They were everywhere. 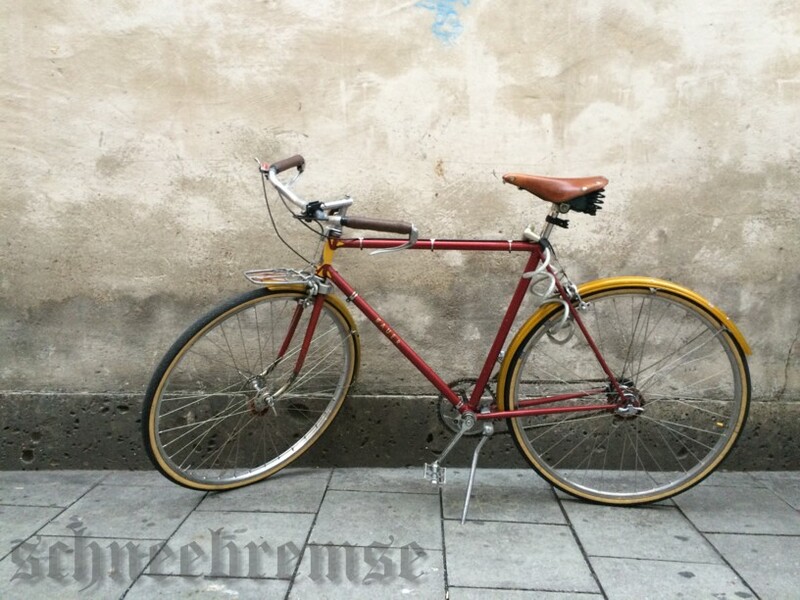 You can find new elegant Duch Gazelle lady bicycles, worn vintage German Bauer’s. There was old Italian Bianchi’s one and another old Swiss army bicycle complete with leather bags and original saddle. There were fixies, single speeders, cruisers and cargo bicycles. All handled with the skills of professional riders. There was one crossing where the bicycle riders came down a hill at very fast speed. If you happened to walk out in the designated area for bicycles on the side walk. An symphony of bells would sound and angry gestures from the riders. I used to call them “Giro de Munich” riders. I was a great vacation! Sadly I had no bicycle. But now there is a dream of mine. That is to ride my Pelago bicycle in the English garden a nice summer day. I bet it will be a real eye catcher. Or perhaps I will try to find a old Bauer for sale. Like the one on the photo below. Or a really old one, with an big headlight and rod operated breaks. Or a Bianchi where the rear calliper brake wire goes inside the frame. They all are really great looking. “Opps, I did it again” as the song says. After the #bikeintweed2013 event, where I and a friend participated on a blue Rex Duplex tandem (the bicycle belonged to the friend). I realized that it is really fun to ride a tandem bicycle. 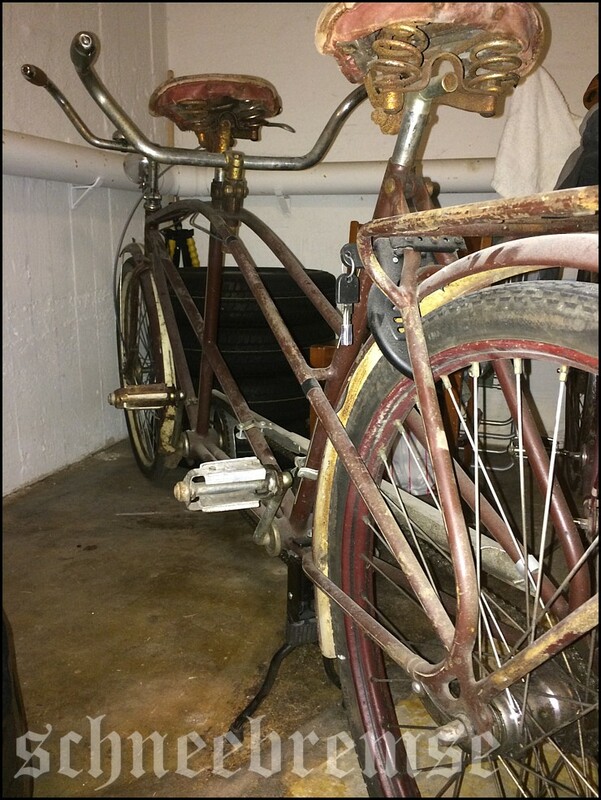 So, just for fun I started to look in the local ads for old tandem bicycles. No luck right away, but a few months later. There it was. The perfect project for me, I do not mind working, renovating and fixing. Quite the opposite. I enjoy working with my hands. Just take a look at “Lady blue“, she is soon ready for the spring sun. The Rex tandem was for sale just outside a town 2 hours car travel from here. My brother helped out and said that we could make it as a road trip. Chat about life and get up to date with everything meanwhile driving there. Join pleasure with work, in a way . So, we went there a few days later. I had told the fellow with the ad that I would buy the bicycle and left a deposit. It was fine with him. He also told me that he would tell me the story behind it as he knew when we picked the bicycle up. We got there, in the middle of nowhere, sometimes the modern technology is great to have. Thanks to the GPS, we found the sellers place right away. There is was, dirty and a bit rusty, after all it is 60-70 years old. All parts needed where there, no parts were missing. Some where new, but nothing critical. He told me that he bought the bicycle 1.5 years ago, as it turned out from the same area where I live now. The bicycle was going “home” so to speak. He also told me the that he and his wife were using it on some cultural events in this small town. But she did not like to sit and being not able to steer, she was a used to ride a regular bicycle and able to steer. But the main reason was that he after visited the cultural event and he had one to many to drink and was going to dismount, his leg got caught in the rear handlebar and he fell, with the bicycle on top of him, rather bad. Causing him a 9 week sick leave. Or as he put it “it became a very expensive bicycle”. After some more talk and him showing us some other projects he had in his garage. I gave him the money, I got a receipt we said good by and my brother and I lifted up the bicycle on the car roof and secured it. Let us go back home! The journey home was calm and with no major issues. Back home, we unload the bicycle and I put it in the basement along with “Lady blue“, “Black Malin” and “Mr Hermes“. It starts to look like an bicycle shop there. Little about the bicycle itself. This Rex Duplex tandem bicycle is made about 1940 in the Swedish town of Halmstad. (Here is a small film about the town, but also where they made Rex bicycles click here for the film). It is in Swedish, but it is fun to see the old work shop for bicycles, how they made them, painted and put them together. I realize where I would like to work, sadly 70 years to late. The word Duplex is the name of the frame style with two frame tubes on top curving down to the rear wheel hub. All Rex tandems where of this style and it was a very popular and steady frame, at least I have never seen a Rex tandem without this frame. Many of the standard Rex bicycles got this double frame to. About the tandems, entire family’s used to ride them, father and mother on the seats, kids on the luggage rack and so on. In the years before the 2’nd world war and up to the 1950’s the main way to get around was with a bicycle. Tandems where good for family vacations, just add an small trolley at the back. Then you got everything with you. Tent, sleeping bags, stove, food, water. So they are used to pull a heavy load. The one I bought now has a year stamp on its rear wheel hub, a German Torpedo hub. The wheel itself looks like it has been changed but the stamp says “40” that is a sign for 1940. But it is a good match with the other details on the bicycle. 1930’s style ASEA dynamo, pre-rear light, the handlebars has the mid 1930’s curves and the seats that where the typical “Terry” seats, today they are really rare in good condition. They where made with soft leather and horse hair as filling. One rain shower and the seat starts to fall apart. Imagen 60 years of being outside. The seats are original, but in very poor condition. The pedals are typical “reform” style. They are badly damaged so I need to find new ones. So all signs says it is from 1940. But one fun detail is that is still got it’s original luggage rack. Rex used to weld the rack into the frame itself. So in the 1950’s when the “help engines” became popular, many luggage racks where cut of and replaced by an engine. But this one never had that faith coming. That is great! The only real damage is to the front mud guard. It is as they have being riding down a large curb, and the stone crushed the tail for the mud guard. But since they were so long (deep) back then. I can make a good looking finish to the guard. The main part that is changed is the chain guard. It is made by the fellow I bought the bicycle from. It is a really good and sturdy guard. It is to modern sadly, but it works. I will have a think about that one. Perhaps find two 1930’s ones and do a version my self. We will see. The mechanical issues is only the front crank bearing is loose. I will take a closer look on that one. I see no real problems with it. It will be a fun project. The nights are saved, no sleep. The light will shine and the smell of oil and grease will again spread in the air.